Details Zinc oxide is one of the principal white pigments developed in the 18th century, but became popular in art only until after the 1850s. It was more commonly known as zinc white or Chinese white. Zinc oxide or more commonly known in the art world as zinc white is one of the three white pigments -- lead, titanium and zinc -- used extensively for artistic and decorative paints. Although known since ancient times, zinc white apparently was not seriously considered an artists' pigment until after the 1850s. The widest application of the pure pigment has been in watercolors, sold under the name Chinese white, but is found often in mixtures with other pigments in oil and acrylic paints. Zinc oxide is widely available today, manufactured by numerous companies. The manufacturing process of zinc oxide is designated in commerce as the "indirect" or "French process" zinc oxide made from the metal and the "direct" or "American process," which is zinc oxide made from the ore and, hence, traditionally somewhat less pure. The terms nodular and acicular are used to describe the particle shapes. Zinc oxide paints tend to retain their original whiteness during aging, not only in watercolor but to a great extent in oil paint as well. Compared with other white pigments ground with oil, zinc oxide often exhibits the least tendency to yellow. The pigment tends to react with fatty acids present in drying oil, leading to the formation of zinc soaps. A soap is a metal salt of an organic acid. The reactivity of zinc oxide is affected by the particle size and morphology, with smaller particles being more reactive. In the case of linseed oil, the formation of zinc soaps from zinc oxide tends to harden the paint film. A 28-year study completed in 2007 by Mecklenburg and Tumosa of the Smithsonian Institution shows that zinc oxide can cause brittleness and delamination of oil paint film even when zinc oxide is used in small amounts. Zinc oxide has a tendency to catalyze the formation of hydrogen peroxide when irradiated by near ultraviolet light. This reaction and the formation of zinc soaps can cause chalking and embrittlement of oil paints films. In view of these recent findings, we do not recommend the use zinc white in the ground or underlayers of an oil painting and caution its use in all oil paint. 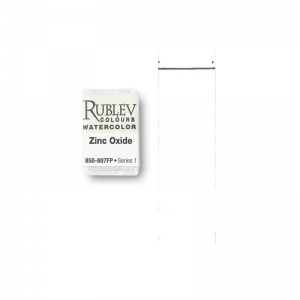 Zinc white is compatible with all inorganic pigments. It is stable toward light in the sense that it does not discolor. However, owing to its photochemical reactivity, zinc oxide will affect the fading of various organic pigments. Zinc white will accelerate the light fading process of artists' paint that contain organic pigments, such as madder lake, alizarin lake and Prussian blue. Zinc oxide absorbs a moderate amount of oil. The oil absorption ratio varies considerably at least from 20-25%, depending on the particle size and shape. Certain manufacturing procedures make it possible to produce pigment grades that demand less oil, 14-15% oil in paste. Zinc oxide is not considered to be hazardous, but care should be used in handling the dry powder pigment to avoid inhaling the dust.